"With huge deficits currently having no evident effect on either inflation or long-term interest rates, the budget constraints of the past are missing. It is little comfort that the dollar is still the least worst of the major fiat currencies. But the inexorable rise in the price of gold indicates a large number of investors are seeking a safe haven beyond fiat currencies." It is interesting than when his former no.2 and Time Magazine Person of the Year, Ben Bernanke, was asked about this rise in gold price, his answer was: "I don’t fully understand movements in the gold price." Perhaps, mr. Bernanke should read the new Alan Greenspan for education. "The U.S. government can create dollars at will to meet any obligation, and it will doubtless continue to do so. U.S. Treasurys are thus free of credit risk. But they are not free of interest rate risk." Ahh, the joy of money helicopters, why did Sir Alan have to ruin it? "Only politically toxic cuts or rationing of medical care, a marked rise in the eligible age for health and retirement benefits, or significant inflation, can close the deficit. I rule out large tax increases that would sap economic growth (and the tax base) and accordingly achieve little added revenues." Can anyone see elected officials rasing taxes or cutting away retirement benefits? If you believe that any of those things are politically feasible, then there is not much to worry about. The rest of us must realize that current financial risk is higher than it was before the 2008 collapse. Except that it is a different kind of risk. 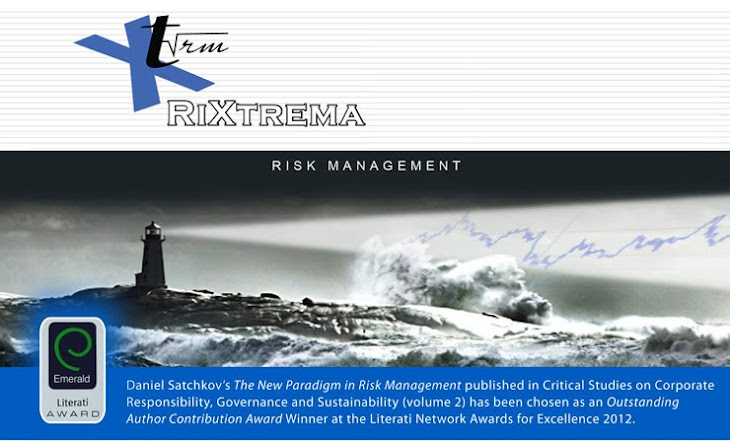 We extensively wrote about the types of risk we are facing here. Currency stress testing, hedging and carefully monitoring any long duration exposure to sovereign debt must be on the mind of every risk manager. It is important to note that the interconnectdness of the global economy all but precludes the possibility of only one major country devaluing the currency (unless it is a hyperinflation). Thus, currency risk is high all around and most of the countries will be forced to devalue along with US. The US dollar will be the last one to fall. In the end of 2009, we predicted that the next decade will be that of Black Swans. Of course, they look more like Grey Swans, because they will not be a complete surprise to many observers, but their timing and particular trajectory could be unlike anything we have seen to date. Buckle up!